Richmond Park is London’s biggest Royal Park and a treat for dog walkers with easy access and plenty of green spaces, woodlands and ponds. The Park is also home to the Isabella Plantation, a huge woodland garden within a Victorian plantation, best known for its evergreen azaleas. Dogs will need to be kept on their lead in this stunning spot but it is a worthy diversion. Dog walkers are advised to avoid the park during the deer rutting season in September and October and birthing season from May to July. The South West Coast Path offers plenty of walking for you and your furry friend. There are miles of footpaths to explore on the Golden Cap estate with many offering magnificent views across the Jurassic Coast, a UNESCO World Heritage Site. Join the path at Stonebarrow Hill, near Charmouth for a two mile circular walk in this designated Area of Outstanding Natural Beauty (AONB). Take the dog for a splash in the sea at Charmouth’s east beach (dogs are allowed after 6pm during summer). Rhossili Beach on the Gower coast of Wales is one of the most beautiful beaches in the world with three miles of sandy shoreline and wonderful views welcoming dog walkers all year round. Check the tide times before you set out, and bring a ball and you can easily spend hours walking on the beach. Your dog will be in its element running free through the ancient forests, rolling chalk lands and lush meadows which dominate this estate. Ashridge is not only rich in wildlife, it abounds with history too. Along its walking trails, you will run into Iron Age farms, Roman settlements and ancient monuments that represent Ashridge’s colourful past, including the Bridgewater Monument, built in 1832 in memory of the third Duke of Bridgewater who lived in Ashridge House. Climb to the top of Ivinghoe Beacon and enjoy a well-earned rest with your canine pal as you gaze at the Bronze Age burial grounds and rutted cattle tracks. Woolbeding National Trust contains picturesque parkland and river walks open to the public on Thursdays and Fridays from April to September. You and your dog will gain access to the 16,500 acre Cowdray Park and Castle at Midhurst. There are several wonderful walks around this peaceful part of Sussex. Stroll along the River Rother, ramble in the woods or stomp across the open meadows and, if you’re feeling energetic, you could take in all three and marvel at fresh views and wildlife at every turn. 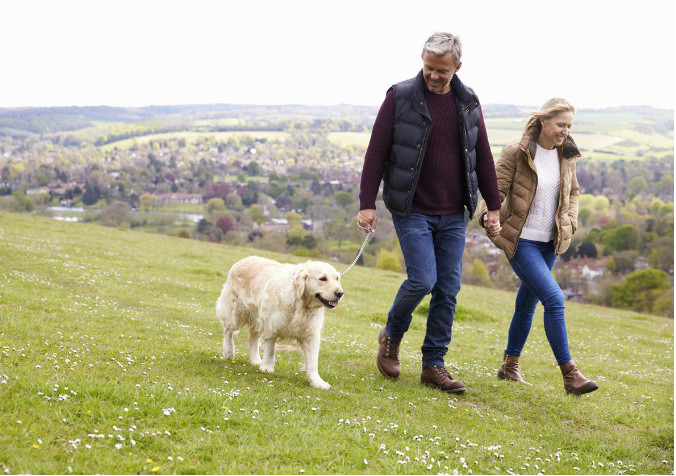 The suggested Midhurst River Walk takes you through woods, across meadows and around a large lake for a walk both you and your dog will treasure. Enjoy a relaxing circular walk through this beautiful estate belonging to the 18th century mansion of the Berwick family. A visit to the mansion is a discovery of the family story from the Picture Gallery roof that contributed to bankruptcy to the prized paintings of the fifth Lord Berwick. Explore the wide open spaces and 370 acres of glorious woodland, along with five miles of river – great for paddling with your four legged friend. Look out for the resident wildlife including some 200 fallow deer in the Deer Park. You will find Hardcastle Crags just west of Halifax. The three-mile trail takes you to explore the wooded valleys brimming with tumbling steams and mossy rocks. You and your dog can enjoy the rocky paths to the hilltops or take it a little easier by the old weirs, ideal for paw dipping in the fresh water. Don’t miss the 19th century Gibson Mill, now a cafe and shop. This may well become your favourite place for a game of fetch. The wide open spaces on this 2.5 mile circular walk are breathtaking as you traverse rolling Devonshire countryside, marvelling at distant views of orchards and gardens. There’s also the 18th century Killerton House with its glorious landscape garden to explore which is surrounded by lush parkland packed with rare and giant trees. A walk through the oak woods bordering the River Plym offers breathtaking views across the valley from the red trail while dogs are well entertained by the varied terrain. Along the path, you may well spot sea trout, peregrine falcons, dippers, kingfishers, deer and other wildlife. Pencarrow House and gardens attracts lovers of formal landscaping and woodland walks. Dogs are welcome provided they are kept on the lead near the house and Peacock Café, however once you reach the woodland walks, they are allowed to run free. Water bowls are available outside the shop and the cafe. Don’t forget to reward your beloved canine with a complimentary dog biscuit from the gift shop. Look into options for covering medical insurance for you and your family. Can You Bring Insulin Needles on a Plane?